What clearance price is your Achilles Heel? Home » Frugal Living » What clearance price is your Achilles Heel? Some people are suckers for bargains of any kind. Others, well, even a genuine FREE offer is difficult for them to take up. But most of us, myself included, have a magic number. It’s in the form of a percentage printed on wonderful clearance sticker, and it is scary how many times it has pulled me in like a tractor beam. Now, I’m not including sale prices on items you were actually going to buy anyway. If you see a 10% off sticker on a bottle of juice or box of cereal, fair enough. Even if it’s a big box item like a washing machine, if you were already out shopping for one, that doesn’t count either. No, what I’m talking about here is the magic number that draws you away from what you were doing, and before you know it has you holding the sale item in your hand like the golden idol in Raiders Of The Lost Ark. You’re mesmerized, because man, it’s so cheap. So what’s your number? For me, it’s 75% off (or more). Some people will take any discount, even those measly 15% offerings. Nah, not for me. Others get sucked in by the 40% of 50% clearance stickers. Personally, that’s a sale but it’s no clearance. But when I see 75% off, I’m there. It is my Achilles Heel. And by the time it’s hit 90% off, I’m almost always a lost cause. I’ll find myself searching through the deepest recesses in my brain, looking for a reason, any reason, to buy it. It’s really worrying to me to look back and reflect upon how much completely unnecessary crap I will consider buying when that price tag is on it. After Halloween, I’ll try and avoid Target. See, all of the costumes and funky accessories get slammed down to silly prices. First 50% off, then a week later that magic 75% off sign is displayed. Last November I had to go to Target for a wiper blade and walked past the Halloween clearance. Before I knew what had hit me, I was walking out with adult-sized Spiderman and Davy Jones costumes. And no wiper blade! They were 90% off, and $5 for either of those costumes is a bargain. Fortunately, I found a use for Spiderman. 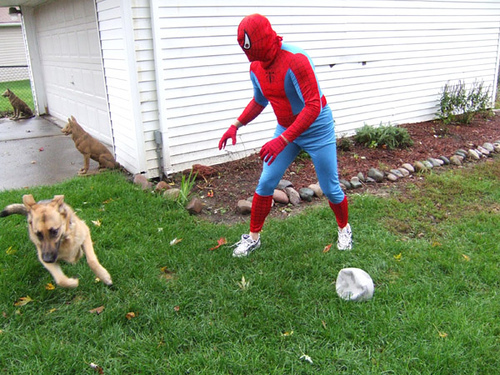 It was my nephew’s birthday a few months later and Spiderman was there to make a surprise visit. $5 well spent in that case (although I ended up forking out an extra $20 online for gloves and feet covers). Davy Jones is still gathering dust in my garage. Will I use him this year? Doubtful, that movie is not quite flavor of the month any more…but we’ll see. The 75% off sticker has got me in other ways. 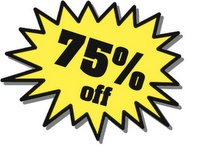 Online, if I see a sale advertised for 75% off or more, I’m at that website in a flash. One time I spent half an hour at the Hot Topic site searching for something to buy in their 75% off sale. I couldn't find anything, and believe me, I was trying. Then I had a moment of clarity, shut up my laptop and picked up a good book. It almost got to me. Almost. What I’m saying here folks is that whatever your magic number is, think twice before you get to the checkout (in person or online), with a vastly reduced but pointless “thing.” Do you really need that complete set of walrus polishing brushes? Is the glow in the dark eye-mask necessary? Remember too that the reason a lot of these items have such big clearance stickers is that they weren’t selling. Probably because they’re outdated, broken or just plain crap! Frasier Crane once said, in my all-time favorite Frasier episode, “it may be an unwise man who doesn't learn from his own mistakes, but it's an absolute idiot that doesn't learn from other people's.” Learn from my mistakes and my Achilles Heel. Don’t be taken in by the magic clearance price. I walk Target just to look at the clearance shelves. Last November I hit the jackpot with a 90% off sale on Halloween merch at K-Mart. I spent ~$50. I think my toddlers might want to move out of the house once I get all of the decorations up. Yep, you nailed it. 75-90% signs are like a magnet for me. "Don't I really need a ____? ", I'll ask myself. In most cases, the answer is a good solid "no", but I'll work myself around to thinking that I do. It's enough of a problem that I've pretty much had to cut out going in stores or looking at sale fliers. Instead, I keep an ongoing "wish list". If, say, thread is on the wish list and I get a substantial coupon from a fabric store, I'll go get that item. Otherwise, the coupon goes in a box (or email folder). I have enough possessions for three or four people. No more trolling! Other than gnomes, I tend to ask myself whether or not I really need something before I buy it. And I try to never shop unchaperoned in case I ignore my inner voice that tells me I simply must have that case of pickled kumquats for $1. 1. Remembering what I have at home (already have three orange shirts at home, even if it is the color that looks best on me). 3. Coming up with a place to put the item and when I will actually use it. I also buy things at 75% or more off to donate. Between my church silent auction to raise money for summer mission trips, toys for Tots at Christmas time and a couple of other events/groups, I have a number of great opportunities to support causes I believe in. And, based on my tax bracket and itemizing deductions using the full price of the items (which is allowed for new items), getting something at 75% off ends up eventually costing me only the cost of sales tax and any lost interest between the time I spend the money and the time I get my tax return. At 90% off, I actually come out slightly ahead. It's always good to look at a discount rack because you might find something you would like at a price you can actually afford! I am a sucker for Barnes & Noble discount books - great for presents! My weakness is thriftshop stuff - and yard sales - all those things I longed for at higher prices suddenly affordable - Just got an artsy pink messenger bag/purse for $2 - Do I NEED it? Well, it's not a necessity - but it sure is cool & will make a certain pinkish outfit more hip! But then, men never understand accessories, do they? I'm a sucker for the 75% off too... i start salivating... and if I have a coupon for it too... it's a done deal... And on those occasions I see the 90% off... well I have been known to push out an entire cart of dish detergent from Wal-Mart at that point... lately though i've been trying to practice restraint... unless it's something I regularly use or discounted prices makes it less than $2 I try to pass... but I think about it the rest of the day! Since I'm in there every day. Last year we moved across the street from a CVS. I happened to pop in while out on a walk with my kids, and found the summer gear -- Slip n Slide, kids' pool floaties, etc. -- at 90 percent off. This year, I can't WAIT. The funny thing is when I buy something that turns out to be useful at 90% off, I always end up hating myself for not buying ALL OF THEM. Like after Easter this year, I got a few rolls of red and purple cellophane at 90 percent off, 16 cents a roll. They only have enough on them to cover one gift basket, but oh, how handy they were at the end of the school year for wrapping the cookies and muffins we made for my daughters' teachers. Since they ran out, I have many times wished for more, and now I must wait until after next Easter. Because I might be able to sell it for more on eBay. If it's greater than 50% at the grocery store I usually buy it, because then I can get one for me and one for the food bank for the price I normally budget. After one memorable spring in which many oh-so-adorable clearance trinkets ended up in my driveway to become someone else's treasure (in other words, I had a yard sale), I implemented a "yard sale rule." It's simple: when the siren song of the clearance sale draws me in, I ask myself, "Will I enjoy this for years to come or will it end up in another yard sale?" If I even waver, it stays on the shelf. If I'm still thinking about the item a few days later, I'll go pick it up. Last yard sale, I had far fewer of those type things populating my driveway. As the mother of two constantly growing children, however, I do shop the clearance racks in the clothing departments. Most stores in the US have all of their summer merchandise on clearance now. I live in the Southeastern US, where we may have hot weather through mid-October. So it's a good time to stock up on a few extra items to see them through that time, especially since some are starting to look worn from months of constant use. HAS to definitely be [or used to be because I don't see it anymore] the $1.77 pricetags on the JC Penney children's clearance racks! awesome!!! I no longer have an achilles heel when it comes to pricing although I used to. I'm a sucker for clothes and was always buying stuff because it was cheap or highly discounted and I realized I had a closet for of clothes I was "meh" about now I just buy fewer pieces of what I REALLY like.